Versatile, prompt, and reliable, The Print House has been meeting customers’ printing needs for over 30 years. Yosef Laine started the business after immigrating to New York from Israel and could not find work. What started as a small printing press in Park Slope has grown to be the large operation located now in East Williamsburg, occupying over 100,000 square feet of space. A family business to this day, The Print House specializes in printing magazines, catalogs, brochures, books, envelopes, mailings, and more. Its clients run the gamut and include retailers, small and large businesses, government agencies, non-profits, and religious institutions. Currently, the majority of its work comes from small printers who do not have the capacity for larger or custom jobs. Employing a staff of around one hundred, the company recruits skilled workers in the area and trains on the job as well. Designers, pressmen, technicians, quality control, are just some of the roles that help The Print House run from day to day. In addition to hiring from the community, the Print House regularly donates works for local organizations. 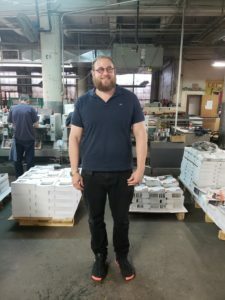 Yossi Majer, The Print House’s Head of Sales, has been with the company for twelve years and has seen it grow and evolve. During his time with The Print House, the company has grown immensely with digital and offset printing, die cutting, binding, and all sorts of finishing. They use soy based inks and only recycled papers, and there is zero waste; all scraps get recycled. Mr. Majer and The Print House take pride in the company’s output quality and quick turnaround time. They are open to any job as no run is too long or too short and no project is too crazy…if it’s made of paper they can do it!